Let's eat. Let's eat together. Let's Eat@Home. Here are some recipes to help. to get a picture before guests dug into it. 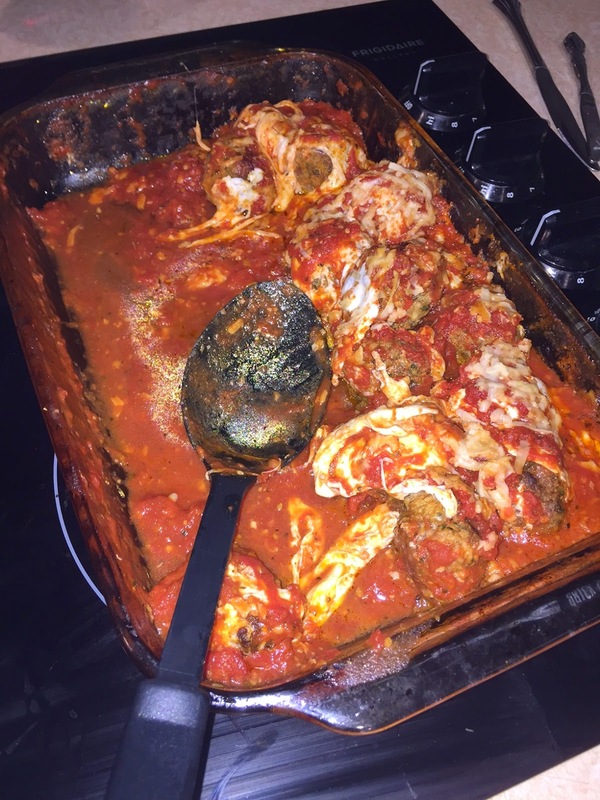 I made an awesome Meatball Parmesan dish the other night for six. It was a combination of two recipes that I happened upon, a wonderful serendipity of my reading appetite. The first recipe I stumbled upon was this one -- from an Esquire magazine article entitled “The meatball recipe to conquer all others.” Now, who wouldn’t be attracted to a headline like that? And it is indeed quite the fantastic meatball, made from not one, not two, not three, but six different meats, at least in the version I created. The recipe, as you’ll see when you click into it, calls for a pound of ground beef, a pound of ground veal, a pound of ground pork, and either a pound of pancetta (an Italian bacon made of pork belly meat) or a pound of cured bacon. I chose to use a half a pound of the pancetta and a half a pound of the bacon. The other recipe I happened up was in the New York Times for Meatball Parmesan. The recipe is here. What I did was to substitute the NYT meatballs for the Esquire meatballs. And, though I have my own red sauce recipe, I did use the NYT recipe for the sauce. I served it with penne pasta and salad. This was almost an all-day affair in the kitchen. I started at 11:30 a.m. with the prep of the meatballs, and I was in and out of the kitchen until everyone was assembled for dinner at about 6 p.m. This isn’t the first time I’ve featured homemade pizza here. I made pizza the other night, with a wheat-based crust, using store-bought dough. Then I rolled the edges of dough over to build an edge for the crust. This worked real well for me. I had a great looking crust with nice edging, and to the edging I brushed on some olive oil and sprinkled on some Parmesan cheese. 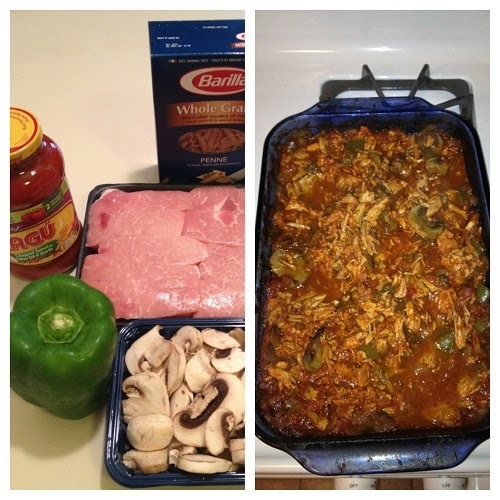 To the body of the pizza, besides store-bought pizza sauce and a package of mixed Italian cheeses, I added cut up pieces of chicken sausage that I had cooked on the grill, sweet onion and sweet pepper that I had grilled, and mushrooms. 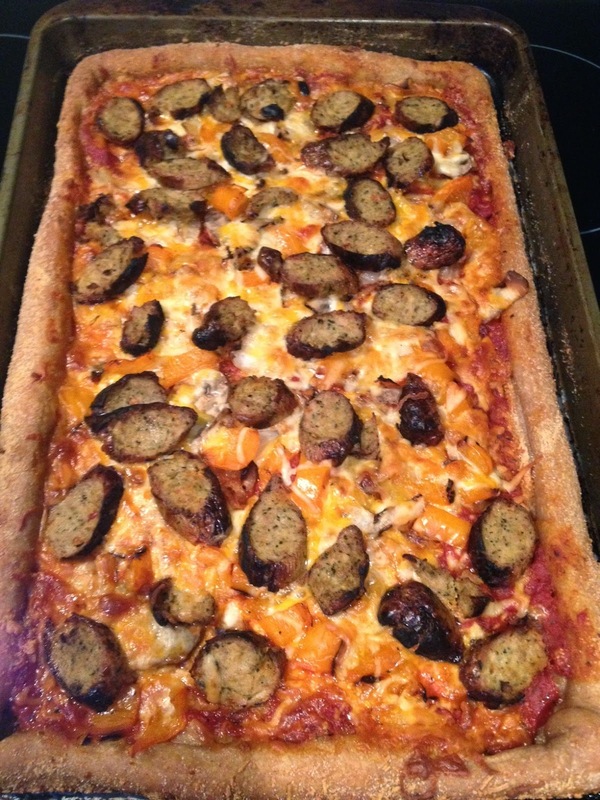 It was a big hit, so big that my wife Jane said we can’t do take-out pizza anymore. Often when I shop for groceries, I have no clue what the meals will be for the coming week. I simply go up and down the aisles and let inspiration decide. I do a mental calculation of what’s already at home, what we haven’t had in a while, what looks good, what might go together in combination, and what ingredients I’d need to pull it off. The boneless spare ribs looked particularly good the other day, but my thought process wasn’t to barbeque them as I normally might. I wanted to do something different and I settled on a version of pulled pork involving tomato-based pasta sauce and penne pasta. 12. Top with Italian cheese such as romano or parmesan or mozzarella or, even better, a mixture of your favorites. First off let me say that my cooking game has been way off over the last several weeks. It’s not that I’ve stopped eating, certainly, it’s just that my effort to record some of what I’ve eaten for Eats@Home has been undermined by some changing circumstances in my professional and personal lives. That said, here is a recipe for Meaty Penne from Giada De Laurentiis that caught my eye. On Fathers Day, I was lounging with my daughter Elizabeth in the Connecticut home she and her husband John recently bought. She lounges by watching the Food Network (like father like daughter) and Giada was putting together this wonderfully rich red sauce that included chorizo sausage and Genoa salami. “I’ve got to try that,” I said to Elizabeth. 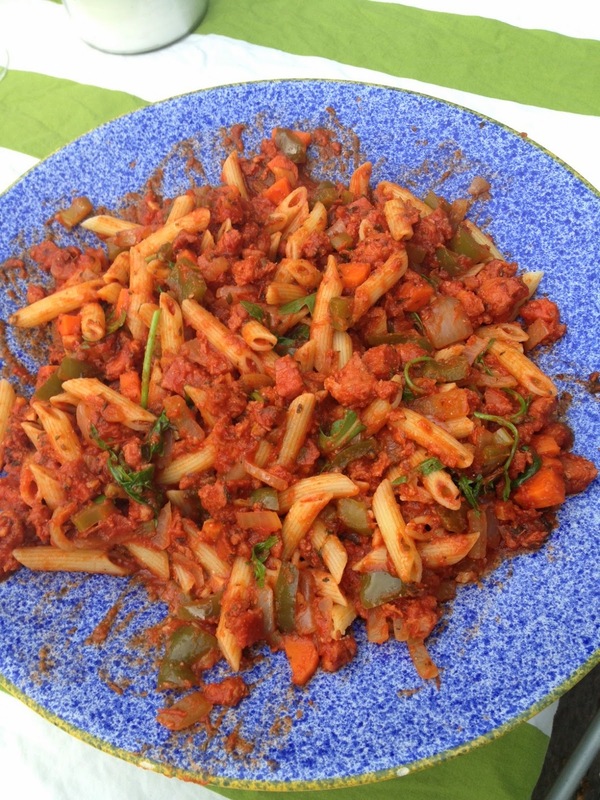 The combination of the cherizo (a Portuguese pork sausage) and the salami caught my attention, but so did the mix of carrot with onion, as well as the topping of arugula that wilted into the steaming mass of cooked penne and red sauce. A note about the arugula: Known for its pungent, peppery flavor it is a classic topping in traditional northern Italian dishes. But it’s strong and can be a put-off to some people. I’d suggest spinach as a substitute for those folks. Also, I added a diced green pepper to this dish - can never have too much green. Here’s a printable form of the recipe. My son in law Jeremy came home from a recent fishing trip with a catch of pollock. It is a white fish, like cod or haddock, but with meat that I think is a little more dense and rich that holds up really well to baking. 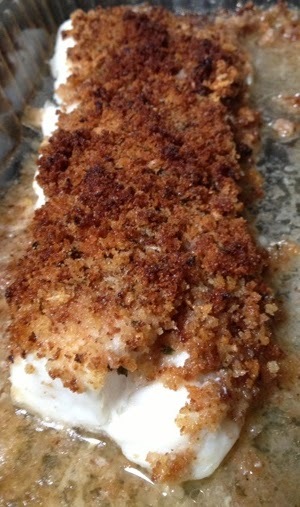 He gave me two fillets and I cooked them up using a recipe that my mother has been using for baked haddock for years. 8. Serve with a garnish of squeezed lemon. This is a wonderful recipe, courtesy of Bon Appetit. 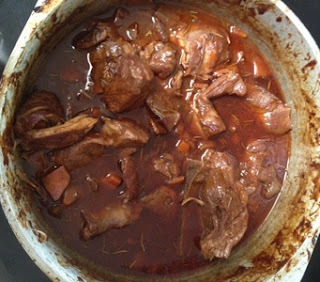 I would describe it as a stew, but the fact that it bakes for so long in the oven puts it more in the category of a bourguignon, but with pork instead of beef. The recipe calls for beef ribs, but I substituted pork ribs. They were a little harder to handle to cut up, but, when done, the meat fell easily from the bone. It is rich and it is full of flavor, helped in heaping amounts by the Cabernet Sauvignon that slowly cooks down in the pot. 12. Serve in shallow bowls over mashed potatoes with sauce spooned over. I had some chicken thighs in the fridge, and did an online search on how I might prepare them. 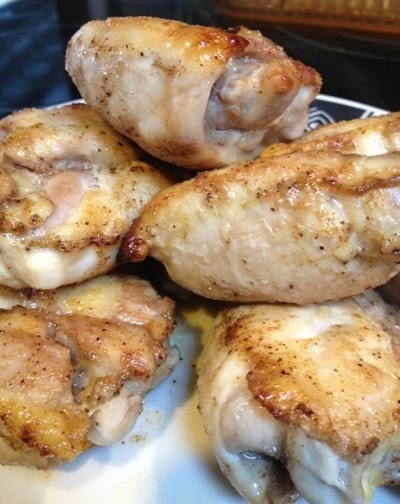 Here was the most interesting of what I saw: Honey Spice Chicken Thighs from the BudgetBytes blog. I did not add the heat of the cayenne as indicated, bowing to my wife’s palate, which tends toward less heat than I might normally add. 6. Return chicken to oven and roast for another 20 minutes. Serve hot. Do you have a recipe with a story? We're looking for contributors. The idea is simple -- good recipes for a home cooked meal usually have a story behind them. That's what we're after here at Eats@Home. I retired from a long career in newspapers and am now a full-time writer, blogger and deep thinker.